The Irish Gift House: Irish Clothing from The Irish Gift House - A Great Way to Show Your Irish Pride on St. Patrick's Day. 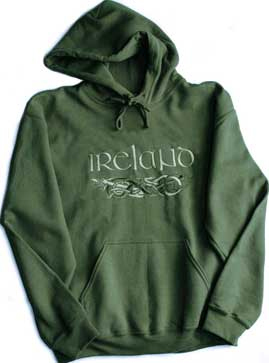 Irish Clothing from The Irish Gift House - A Great Way to Show Your Irish Pride on St. Patrick's Day. facelift, and it is just in time for St. Patrick's Day! Many of the garments in this section, from the Irish flat caps to the Irish sweatshirts with Celtic knots, have received new and much improved product images and everything has been given fresher product descriptions. This section was overdue for a good sprucing and we hope that you enjoy the results that include some new Irish clothing categories such as Irish beanies for your head and shamrock socks along with shamrock slippers for your feet. The most popular Irish clothing categories remain with the Irish t-shirts section reigning supreme with our customers, but the Irish polo shirts and the Irish rugby shirts also get their due. In fact with St. Patrick's Day being on a Friday in 2017 these two sections should prove to be very popular for casual Fridays at the office. If you don't dress down when you are at work, you may always select from our shamrock ties; we have several to choose from that range from conservative to festive. Naturally we have a section for Irish women's clothing with flattering feminine designs. The ladies may also with to browse our Irish scarves to find both fashionable and warm styles. For the wee ones we have Irish baby clothing that ranges from shamrock onesie outfits to dresses for toddlers and we also have an assortment of Children's Irish t-shirt. Some of these t-shirt designs are available in sizes that range from infant to 3XL adult so children and parents may wear the same style shirt. For the wearing of the green on March 17 we have a grand assortment of St. Patrick's Day clothing and costume accessories that vary from leprechaun hats and shamrock hair bows for your head to shamrock stocking for your legs along with everything in between. We will cover more of this section in our next blog post.